Israeli soldiers abducted, on Monday at dawn, two Palestinians in the as-Sammoa’ town, south of the southern West Bank city of Hebron, and installed roadblocks in Hebron city, and nearby towns, before stopping and searching dozens of cars. 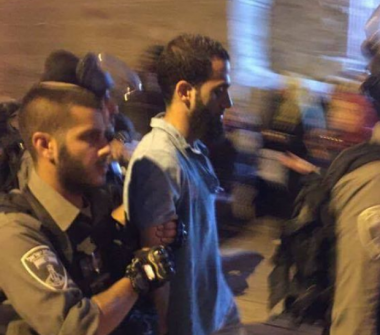 The army also abducted two Palestinians, and demolished a home, in Jerusalem. 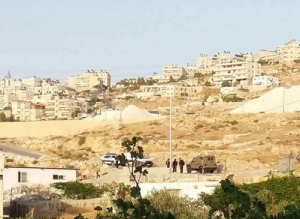 The Hebron office of the Palestinian Prisoners’ Society (PPS) said the soldiers invaded and ransacked homes in Sammoa’ town, abducted Mahmoud Bashir Hawamda and Arafat Sobeh Salameen, and took them to an unknown destination. Furthermore, the soldiers invaded many neighborhoods in Hebron city, in addition to the towns of Sammoa’ and Yatta, and installed many roadblocks, especially at the northern and southern entrances of Hebron city, and the main roads leading to Sa’ir and Halhoul towns, before stopping and searching dozens of cars while interrogating the passengers, and examining their ID cards. In occupied Jerusalem, the soldiers abducted a young man, identified as Mohammad Mkheimer, from Bab al-Amoud area, and a child, identified as Zoheir Da’na, from ar-Ram town, north of the city, after beating him up. Also in Jerusalem, the soldiers invaded Zaim village, east of the city, and demolished a home that was allegedly built without a permit. In addition, the soldiers abducted two Palestinians in Beit Rima town, northwest of the central West Bank city of Ramallah, and in Qalqilia city, in the northern part of the West Bank, and detained many young men at a military roadblock near Jenin, also in the northern part of the West Bank. In related news, Israeli navy ships fired live rounds at Palestinian fishing boats, close to the shore in Khan Younis, in the southern part of the besieged Gaza Strip, wounding two fishermen.